StubHub co-founder and investor Jeff Fluhr is launching his next project today—social video broadcasting platform Spreecast. 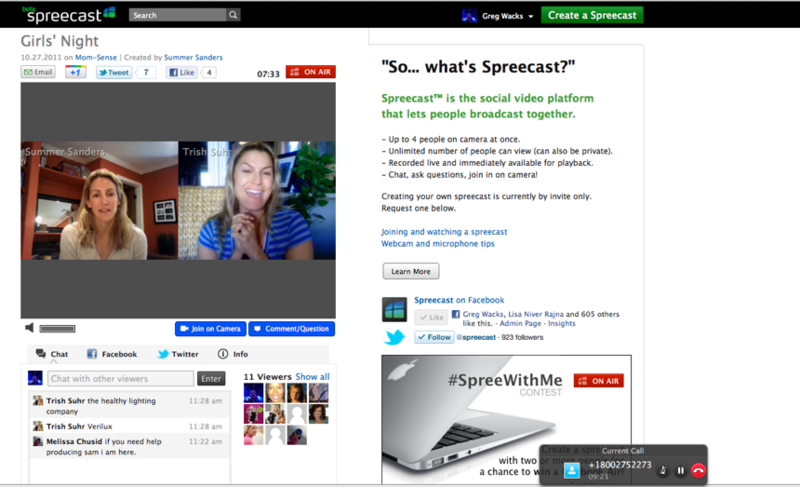 Simply put, Spreecast is a social video platform that lets people broadcast together. Fluhr tells me that he saw a gap in providing a video communications platform that is inherently social and allows multiple people to broadcast their conversations live. While broadcasting startups like Justin.TV and Ustream allow for live broadcasting, the social element of conversation is missing. Thus, the idea for Spreecast was born. In a Spreecast social video stream, up to 4 people at a time can be face-to-face, streaming their conversation live while hundreds of others can watch, chat, and participate by submitting comments and questions to those on screen. The producer controls allow the creator (and other co-producers designated by the creator) to control who gets on camera and when. 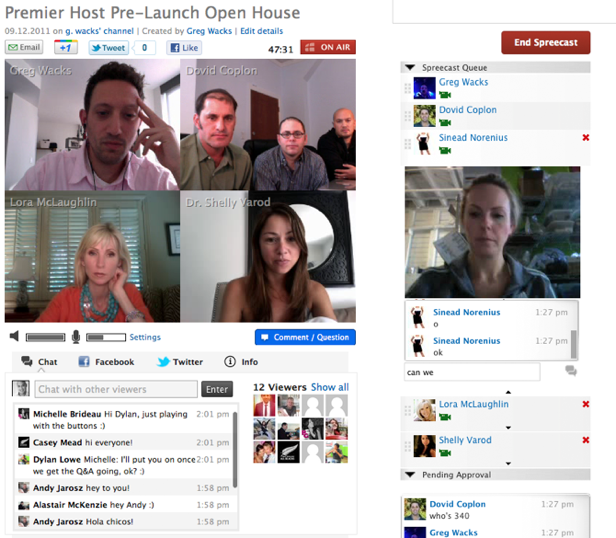 And people can come on and off camera allowing for more than four people during the course of the Spreecast. When a viewer requests to join on camera, the creator can screen them by previewing their video and text chatting with them privately before deciding whether to allow them to go on camera. You can email guests by entering email addresses or importing your gmail contacts. You’ll also be able to Tweet, Google+ or post to your Facebook feed so that your followers and/or friends will be notified about your Spreecast. You can also invite viewers at any time from the Spreecast page – before, during or after a Spreecast (to view the archive). Spreecast is also integrated with Facebook, Twitter, and Google+ so that producers and creators can broadcast their conversations to their friends, followers, circles, contacts and connections. Once live-streamed, Spreecasts are recorded and then made immediately available for playback and sharing. The platform is browser-based and built on Flash. By default, Spreecasts are public and designed to be social but users can also create private Spreecasts as well. The platform, which has raised angel funding to date, has been in beta for the past two months and has seen a number of use-cases by participants. For example, Olympic gold medalist Summer Sanders used Spreecast to share her thoughts after running the Chicago Marathon. Klout CEO and founder Joe Fernandez announced Klout Insights via Spreecast and Zaw Thet from 4INFO unveiled a $40 million funding round and a spin off company. And a number of radio personalities have Spreecasted with their listeners. Of course, Spreecast isn’t the first video-based social broadcasting platform out there. Google Hangouts has a similar functionality, but resides in Google+. Fluhr says that the beauty of Spreecast is that it is independent and can integrate comments and interactions from Facebook, Twitter and Google+. Sean Parker’s Airtime may also play in the same space as well. There is also a Chatroulette element at play here, but the site seems to frown on that type of content and will ban users who use it for that purpose.